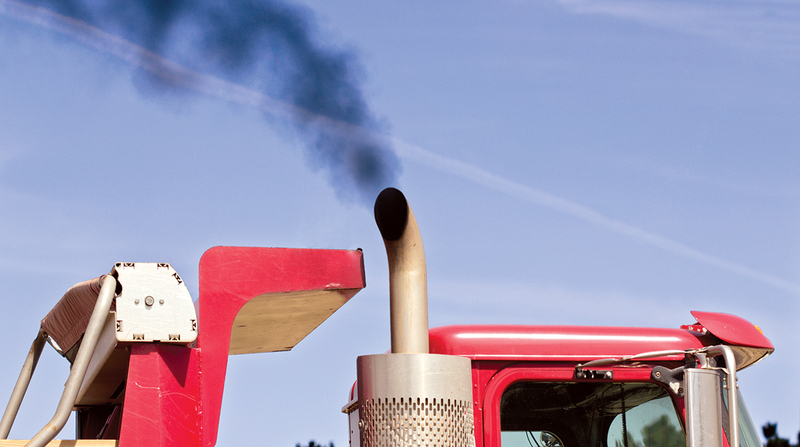 The California Air Resources Board has approved amendments to toughen state standards on heavy truck smoke opacity limits as well as require motor carriers with two or more trucks to report their annual smoke test results to the agency. The objective of the new regulation is to ensure that the state’s heavy-duty vehicles are properly maintained, not tampered with and do not produce excessive smoke or soot, according to the agency. In approving the updated requirements on May 25, the CARB board asked its staff to debrief on the specifics of what the reporting process will look like. The board also asked the agency’s staff to explain how regulators could avoid duplication in the event that legislation introduced earlier this year in the state Senate would require that trucks be smoke-tested annually prior to registration. Opacity tests measure the density and darkness of tailpipe emissions. The darker the smoke, the greater the indication that there could be a maintenance performance issue with the vehicle’s engine. Current regulations require 1991 and newer model year heavy-duty diesel engines to meet a 40% opacity limit and pre-1991 model year diesel engines meet a 55% opacity limit, but only require that carriers retain, not report, the results of opacity tests for two years. Specifically, the updated regulation changes to the state’s Periodic Smoke Inspection Plan include: lowering the exhaust smoke limit to 5% for 2007 and newer engines and engines equipped with Level 3-verified diesel emissions control systems; pre-1991 model year to 40%; 1991-1996 model year to 30%; and 1997-2006 model year to 20%. CARB staff estimates that about 10% of the state’s trucks are operating out of compliance with current opacity limits, and account for 70% of the state’s particulate matter emissions. The new opacity limits will take effect in 2019, while plans call for the reporting requirements to go into effect in 2023, CARB officials said. In general, there has not been significant opposition by the trucking industry over the new standards, which officials say newer trucks should be able to easily meet. However, the California Trucking Association, American Trucking Associations and others are opposed to the reporting requirements. “We understand why the board is lowering opacity standards, but our concern is with the reporting requirement that will further burden already compliant fleets,” Chris Shimoda, vice president of government affairs for the CTA, told the board at its May 25 meeting. The new regulation also requires that smoke testers complete a CARB-approved in-person training course on the proper administration of the smoke opacity test, and that smoke tests be administered within 90 days prior to the sale of a heavy truck. CARB estimates the updated regulation will cost the industry $220 million from 2019 to 2025, but will save an estimated 134 premature deaths over the same period. CARB board member Alexander Sherriffs said it’s obvious that most of the discontent among truckers is over the burden of the reporting requirement, not the regulation itself. The best solution would come in a legislative fix putting trucks in a smoke test program, according to Sherriffs. Steven Cliff, CARB’s deputy executive officer, said that the reporting process will be much simpler for carriers who have onboad diagnostics systems. He anticipates that by 2023 about 75% of trucks will be equipped with onboard diagnostics. “But I don’t want to pretend that this regulation is the way we’re going to get all the smoking trucks,” Cliff added.